Sharron recently spoke to COBCOE about her role as the ICAEW lead on diversity. When I qualified as a Chartered Accountant in 1989, there were few women in accountancy, and even fewer women in senior roles across the wider financial services sector. Since then, the business world has made significant strides to redress this balance, but there is much more work to do. Making the changes needed takes leadership and vision. As the leading professional body for Chartered Accountancy, ICAEW recognises the key role we play in supporting more women to progress in accountancy and finance. As a senior female leader, my first-hand experience of the professional and personal challenges women face as they move up the ladder inspires me to mentor female talent and enable the profession to support women. Women currently represent just under 30% of ICAEW’s membership. This number is set to increase in the coming years, as our students (45% female) qualify as ACAs. This progress is encouraging, but we have a lot more to do to ensure talented young women see this as a career for them. Our profession develops and nurtures talent from all disciplines. Yet still, when people think about Chartered Accountancy, they immediately think you need to have background in maths or sciences – subjects which, consistently, more men study than women. Part of our role is to make sure young women know that being numerate is important, but other skills such as problem solving, communication and team work are just as crucial to a successful career. A background in a non-numerical discipline isn’t a barrier to Chartered Accountancy – but a lack of understanding around the profession, and lack of encouragement for women to see accountancy as a career for them is. To counteract this, we do a lot of work with schools. We have developed a business game and we run a competition every year with schools, called BASE, to get our message out that accountancy is about business, not just about numbers. As an employer, ICAEW has also taken on a number of female interns who have then gone on to train as Chartered Accountants as a result. As a professional body, part of our role is to provide training and continuing professional development (CPD) for our members and member firms. Around 10 years ago, ICAEW launched a pre-board level programme called ‘F-TEN’, to prepare senior managers to take the next step in their careers. The first cohort had only two women out of 22 participants, which led me to talk to the CEOs of some companies and ask why they were not putting women forward. They said that women were not at the right level in the pipeline. I looked at our membership statistics and saw there were plenty of women in the pipeline, and realised we had to offer something different to reach them. In response, we developed an innovative new course called ‘Women in Leadership’ which has been highly successful. Women in Leadership puts the focus on women’s strengths, makes them recognise what they are good at and what their key skills are. This is a tailored programme which works at both an individual level, and also harnesses the power of working in groups of peers with similar challenges too, which can be a life-changing experience. Often leadership development courses focus on fixing what we can’t do, but we find that focusing on the opposite –what you’re good at – enables women to be far more confident in their abilities. Confidence is a sensitive subject, and I have found through mentoring women that there’s often an element of self-doubt holding them back which can take years to overcome. With the right coaching, women can conquer these doubts and really stand out. Women in Leadership runs every year in the UK and has also expanded to run regularly in Malaysia. Many delegates have created life-long networks and strong friendships from the experience. I think diversity in its broadest sense is very important. We are at a turning point where organisations are waking up to the need for their workforce to reflect the client base they serve and the society they operate within. McKinsey & Company’s famous report on gender diversity showed a generation of business leaders that companies with more women on their boards were significantly more profitable. Their latest report found that companies with high levels of ethnic and gender diversity across their workforce and at board level are more likely to exceed profitability margins. The corporate world is responding, and some of the most innovative diversity and inclusion programmes running have been developed by leading accountancy firms. As their professional body, ICAEW strives to be as good as the best of our member firms, and to bring the rest of our firms with us. One way in which we do this is by working with the National Black Women’s Network which supports and connects BAME female entrepreneurs. We also recently partnered with Stonewall on an event to celebrate its Workplace Equality Index, a definitive benchmarking tool for employers to measure their progress on lesbian, gay, bi and trans inclusion in the workplace. International Women’s Day is the ideal moment to reflect on the barriers which women in business and finance have overcome, celebrate their progress, and be inspired to drive the change we still need to see. ICAEW is a COBCOE Strategic Corporate Partner. Sharron Gunn qualified as a Chartered Accountant in 1989. After leaving practice she worked as a financial accountant for Wates City plc before joining J Sainsbury plc in 1993. During her time at the supermarket giant Sharron held a variety of roles, including group management accountant, financial analyst, and commercial manager to the trading division. 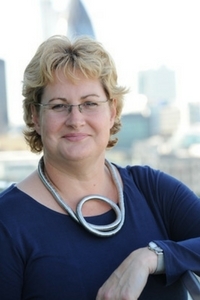 In 2001 Sharron joined the ICAEW and was appointed Executive Director a decade later. Her role has grown over the years and she is now responsible for ICAEW’s commercial arm, member strategy, product development, digital strategy and UK regions; leading a department of more than 200 staff members. She was also recently appointed ICAEW’s Chief Representative for Greater China. During her time at ICAEW, Sharron has launched a successful jobs website and a range of support services.One of these helps members on a career break – especially women – return to the accountancy profession. In 2009 she transformed the Members’ facilities at ICAEW into the Business Centre and played a key role in its refurbishment in 2017, helping it become a magnet for Members. She has also rebranded and launched One Moorgate Place – the institute’s venue – which has grown into a successful business. Furthermore, Sharron leads her team to drive digital transformation across the organization, including the development of an innovative series of virtual conferences.